WHAT CAN YOU DO WITH THIS SURVEILLANCE KIT? 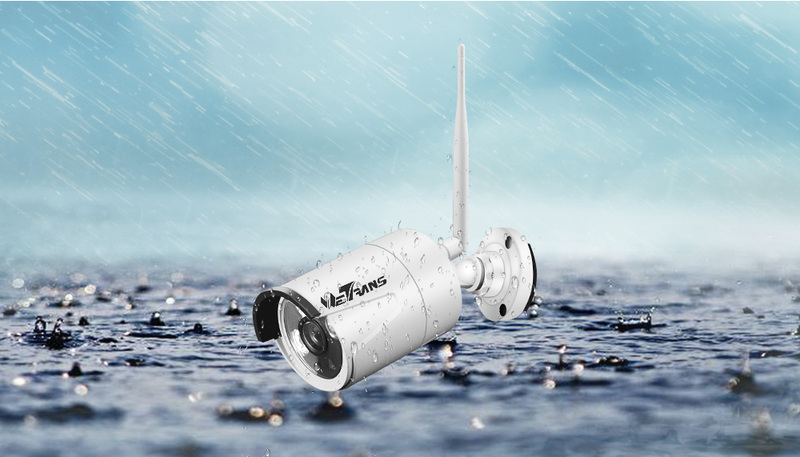 This wireless camera NVR kit can use for indoor or outdoor, monitor house, office, factory, shop, etc. We installed it in our factory. Here are the real shot pictures from the wireless CCTV kit we are using. To install a set of wired CCTV system you need professional skill to do cabling, and it costs highly to hire a skillful worker. Wireless CCTV system does not need cabling step. Camera and NVR connect point to point wirelessly. ​They connect by themselves, what you have to do is to power them on. Real plug and play, super easy installation and configurations. Anyone can operate, no need professional skills. 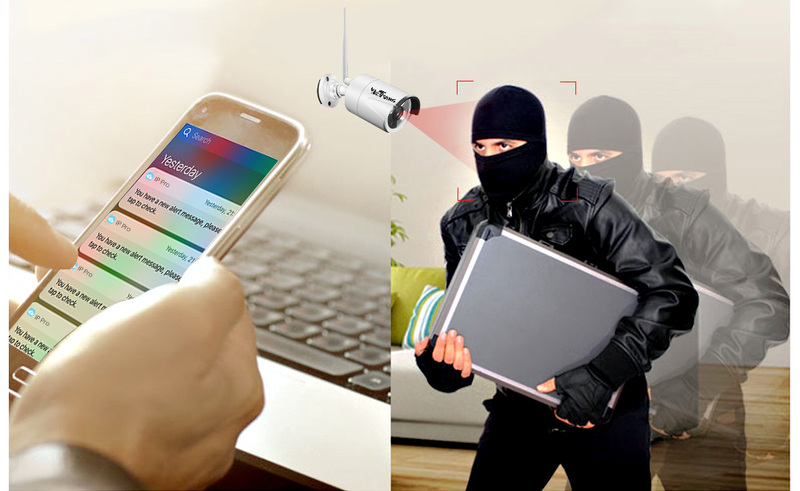 You can build your surveillance system by yourself. Power on camera and NVR, images show on display right away. Down load App IP-PRO, register and log in. Find NVR device ID in "Network setting" and scan QR code. Worrying about working distance? Camera and NVR built in wifi module, signal is strong and stable. Transmission distance up to 100m in open area. 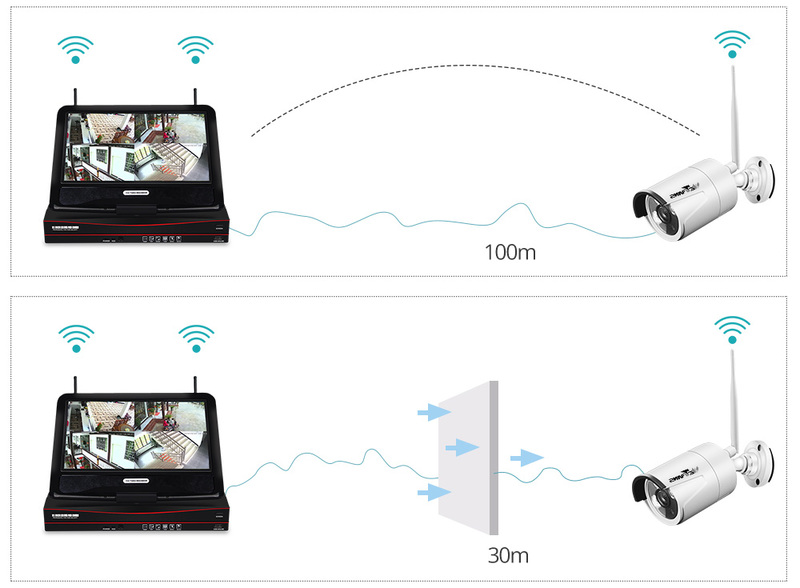 With barrier between camera and NVR the signal transmit max 30m. What\'s more, you can use relay connection to double extend area. Built with high power IR LED and IR cut, night vision up to 20m. Camera housing is aluminum alloy seal with water resistant rubber ring, dust proof and waterproof. No fear of rainy weather. Instant message send to App once motion alarm is triggered and record at same time. You are the first one to know in case thief comes. NVR support multiple languages, including English, Korean, Japanese, Portuguese, Spanish, Russian, French, German,Thai,Italian, etc. A reference chart for HDD choosing, the recording days are estimated, not precise. The higher video quality the more space it needs. Q: Does this Camera support 5G network? A: Our wifi camera only supports 2.4GHZ network so far. Q: Cannot view NVR by smart phone? A: Check if NVR connect to router by cable; check if NVR staus is ONLINE as in below picture. Q: How to visit NVR by computer? A: Only windows OS is supported, not support Mac OS. Open Internet Explorer and visit www.e-seenet.com, type in P2P ID, user name and password. Q: Cannot access the NVR in IE browser? A: You have to download the ActiveX. After install the ActiveX, cameras image comes out. If you cannot get the ActiveX, please set up IE safety setting front 17 options as active. 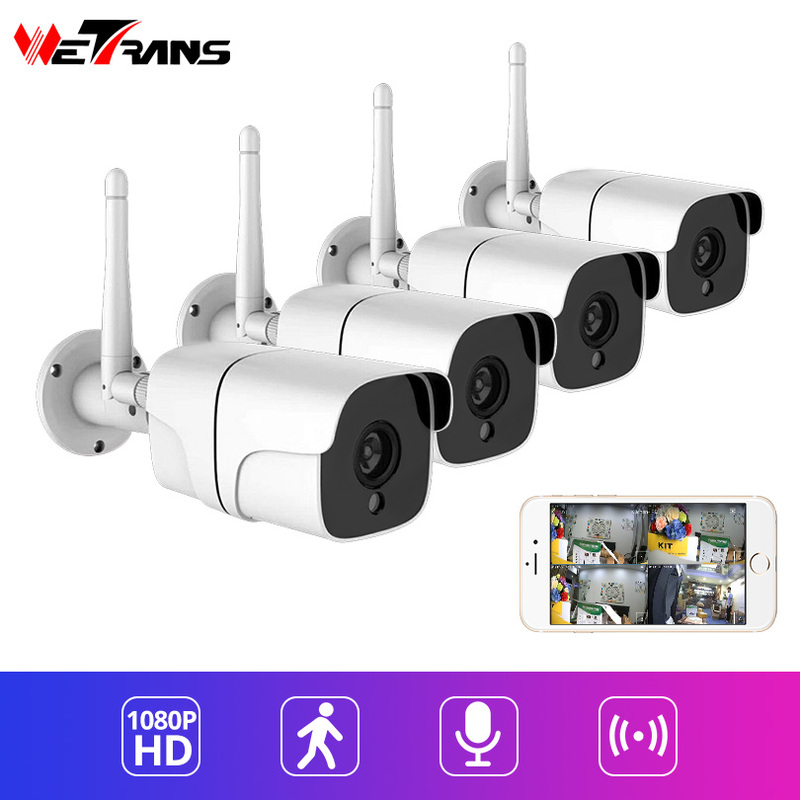 Q: Is there 16 channel wireless CCTV kit? A: The NVR supports max 8 channel. 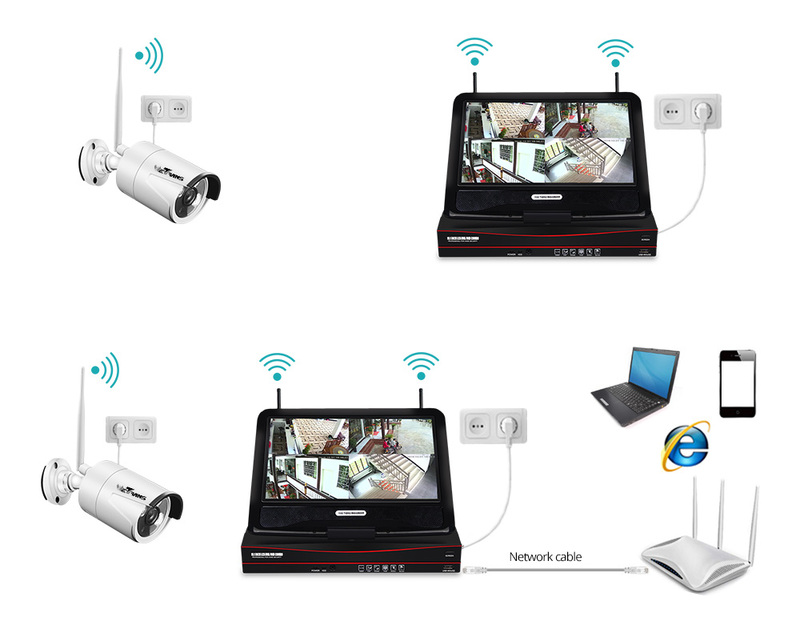 If you need more than 8 channel you may use two sets of wireless CCTV system and view them together by CMS as in below picture. 1) Your payment will be temporarily held by Aliexpress to protect your benefit. We will not get it until you confirm receiving the goods. 2) We will ship items out within 5 business days after your payment is verified by Aliexpress. 3) We support free shipping to most countries. But extra shipping charge is required for remote areas. 4) Buyers are responsible for additional COD charges, VAT, Brokerage Fees, Duty, or Custom Fees and Taxes. 1) We appreciate all our suctomers to post a positive feedback and 5 scores DSR. The star-scores are very important to us. 2) If anything does not meet your expectation please let us know and give us opportunity to make things right. 1) All items are under strict examination before deliver. If you find any problem please contact us before open a dispute. 2) We offer 12 months warranty for our products. We can help to repair or replace within warranty period. 3) Products could be returned within 30 days after you receive it. Returned goods must be unused and in original packaging. 4) The buyer is responsible for the cost of returning.